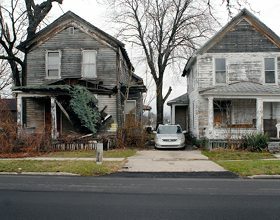 Once a booming, auto manufacturing center, Flint today is a dying industrial town with high poverty and high unemployment. As if that wasn’t enough, the recent water crisis has created added expenses and stresses for the population, with the burden falling on the poor. General Motors employed 80,000 people here in 1970; today the company employs 6,000. There has been a little recent good news: GM announced in January 2011 it will hire back 750 workers to increase truck production. Also on the positive side, Flint is home to 4 institutions of higher learning, including Kettering University, an engineering school that is the fastest growing university in Michigan. But most people who could afford to have left Flint. For the first time since the 1920’s the population is less than 100,000. According to FBI statistics, Flint ranked in the U.S.’s top five most violent cities (with a population of 50,000 or more) from 2007-2013. Flint is located in Genesee County, a little over an hour northwest of Detroit. 54.9% of its population is African-American and 39.4% is white. Family-to-Family’s partner in Flint is the Boys and Girls Club of Greater Flint, an organization that provides extensive afterschool programs for 1,500 area children ages 7 to 17, 70% of whom live at or below the poverty level. Programs include arts classes, literacy programs, sports, a homework center, computers, a video music production center and a game room. BGCGF serves 20,000 meals a year to area children as well. Family-to-Family’s contact at the Boys and Girls Club of Greater Flint is Tauzzari Robinson, who identifies Flint families in need for F-to-F and distributes the monthly food to the families. Food for sponsored families is obtained by Family-to-Family from The Food Bank of Eastern Michigan. In addition to the Sponsor A Family hunger-relief program, Family-to-Family links sponsors with impoverished children who love to read in Flint as well, through the One Book At A Time program. Sources: U.S. Census Bureau: Population Estimates, retrieved 1/24/2011; U.S. Census Bureau: 2005-2009 American Community Survey, FBI Statistics Show Flint fourth most violent city in America, www.mlive.com, U.S. Census Bureau: QuickFacts, retrieved 4/21/2016.